Home › Blog › Blog › Pool Table Q&A: How Much Does a Pool Table Weigh? Posted by : R&R Outdoors, Inc. Many of our customers purchase our pool tables for outside use, and that’s just the way we like it. We changed the game when we introduced our Outdoor Pool Tables to the world, and we’re only getting better! Our Outdoor Pool Tables are built to withstand the elements, designed to cast a stunning silhouette, and engineered to play at the highest of regulation levels. They can also be customized to include logos, and images on both the play field and the table itself. There’s nothing we love more than delivering custom pool tables to happy customers and installing them on decks, next to pools, on balconies overlooking the ocean, or simply in a backyard. 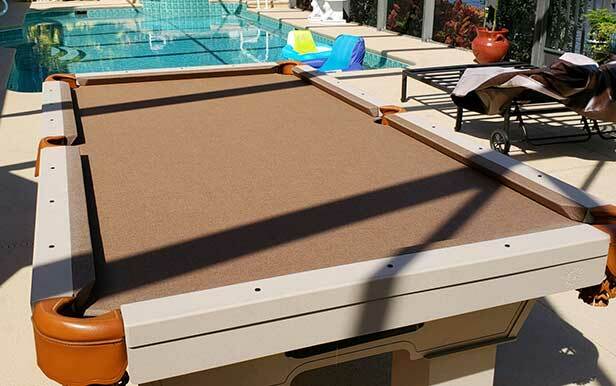 No matter where your new custom outdoor pool table is going, it’s important to understand the weight of the table. This is NO toy! So, How Much Does a Pool Table Weigh? R&R Outdoors Pool Tables weigh between 600 lbs. and 800 lbs. Materials used, dining table conversion tops, and table size all play a part in determining the final weight of your pool table. The heaviest part of your pool table is the slate. Our tables feature 3 pieces of slate fitted to ensure perfect play, and these pieces weigh in between 150-250 pounds each. While 800 lbs. is substantial, it is fine to place on most outdoor surfaces such as decks and balconies. If you are planning to place in a grassy, gravel or sandy area; we can provide you with a footprint so that you can pour a concrete footer to support the 4 legs. How Many Friends Do I Need to Help Me Move My Pool Table? NONE…. Pool tables need a professional installer. If you try to move the table yourself you risk the integrity of the table, damaging the slate (not to mention your back) and it is super hard to get leveled without years of experience and the tools needed to do so. R&R Outdoors is proud to announce that their products are now produced by Olhausen Billiards, who have been manufacturing pool tables since 1972. Our combined production/design experience is over 68 years. Our Outdoor Pool Tables withstand wind, rain, salt water, and snow; and are built for residential and commercial play both indoors and out.